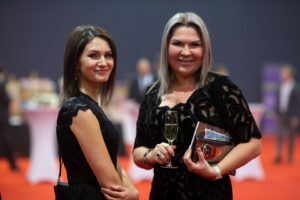 On 15 December at the International Exhibition Center in Kyiv, the Annual Fundraising Dinner and Silent Auction in support of the Ukrainian Catholic University was held. During the event, which was attended by more than 500 friends of UCU, 92 stipends for students and 11 for professors were announced. 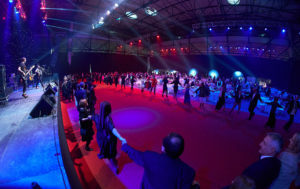 The charity auction raised some 600 thousand hryvnias. The general sum of donations collected reached a record 12 ½ million hryvnias. The evening began with cocktails with members of the Honorary Committee and a silent (and loud) auction. Old friends who have attended the fundraising dinners for a number of years now met here, and those who today came for the first time made a number of new acquaintances. Later the fundraising dinner began with prayer. 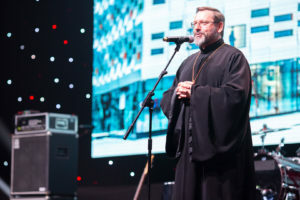 First, the Head of the UGCC, His Beatitude Sviatoslav Shevchuk, was invited to speak. “Today’s UCU Fundraising Dinner in Kyiv is happening at a particularly historic moment for the Christians of Ukraine. Allow me to sincerely congratulate our Orthodox brothers on their Unity Council. 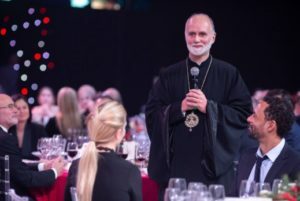 “At this historic moment, I would like to offer a fraternal hand in the name of our Church to the newly-elected head and all Orthodox brothers. Now we are going forward into history, to unity, to truth. To the extent that we today foster unity and overcome that which separates us, on that depends the future of the Church, the people, and a free, independent, European Ukrainian state. 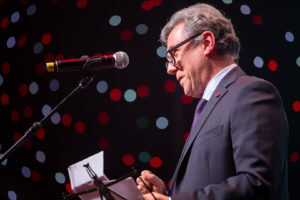 “Ahead there is much work, but I am pleased to hear that, in his first speech, the newly-elected head spoke about the development of theological education. And I am very pleased that it is UCU that is the icon of an open Church, which is simultaneously local and global. Gazing deeply into the secrets of God’s Wisdom, it, at the same time, looks into the heart of today’s person and Ukrainian and looks into the future. Let the internal movement to consolidation and unification not cease,” said His Beatitude Sviatoslav Shevchuk. “There is no need to overwhelm you with the numbers. You yourselves know that UCU is attracting the best minds, both on the territory of Ukraine and beyond. And there is also no need to explain why. The university’s exceptional educational program truly attracts people. 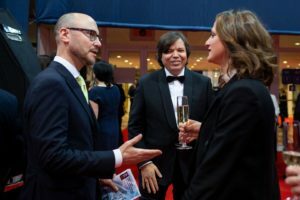 They come here for the spirit of innovation and the feeling of community, and also for the prestige connected with such a highly-respected educational institution. However, the list of reasons for this does not stop. “Recently, Sapienza University of Rome, one of the oldest and biggest in Europe, conducted a detailed survey among its students, trying to determine their needs and expectations. The survey included questions like: Do you think the university is sufficiently modern from the point of view of technology and infrastructure? Would you like to expand recreational opportunities? Is the coffee selection varied enough? The responses shocked everyone, even the most skeptical and experienced academic directors. “The first point on the list of needs and expectations of the students, above all the computers, tennis courts, and cappuccino, was: better relations with teachers. In the time of Fake News and Facebook, our students are looking for live communication with people whom they can trust. In the time of the Internet, they want interaction with those whom they respect. Wikipedia can answer four out of the five journalistic questions. They all start with the letter ‘w’: Who, What, When, and Where. But Wikipedia will never be able to give a satisfactory explanation of ‘Why.’ The question ‘Why’ is truly the only one worth asking. This is the driving force of our desire to study and obtain a higher education. ‘Why” is the question which only an integrated personality is able to answer. For the answer to it requires more than simply study and simply knowledge. This question demands an appropriate intellectual level, and also intuition, and the ability to see higher and farther. Students also expect to see a combination of these qualities in each teacher at the Ukrainian Catholic University: They want their teachers to be as exceptional as they themselves. 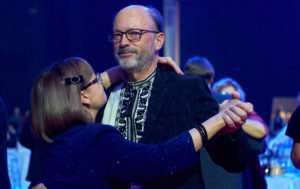 Of course, all the benefactors and guests eagerly awaited the appearance on the stage of one person who for many has become a special comrade and friend, Bishop Borys Gudziak, UCU’s President. 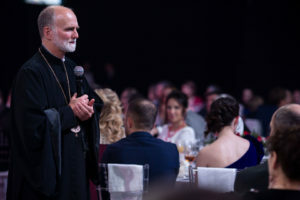 “After today’s events, after His Beatitude’s words, after this joy which inspires us, it’s not easy to speak,” said Bishop Borys Gudziak before his speech. But his next words were one more demonstration that UCU’s mission is historic. “As a church historian, as a Ukrainian, and as a Christian, I am deeply moved by what happened today in our Ukraine: the Lord again blessed a great matter with His mighty hand. “Do we, coming out of the atheistic system of the Soviet Union, have the right not to believe that today is a great day? Our Church was in chains, and all at once we felt new attempts to return us to an ideological prison, to break our contacts with neighbors, to close the road to the world. But our youth led us to the Maidan and thus showed one simple matter—that they are not afraid… Do we have the right to be afraid? “There are still today questions, concerns, challenges, but the most important is life in unity. And this unity, which today found an incarnation in our 1000-year old St. Sophia’s Cathedral, is a foretaste of the Kingdom of God, which each person is called to touch, through love of neighbor and of God. After inspiring speeches, the musical part began. 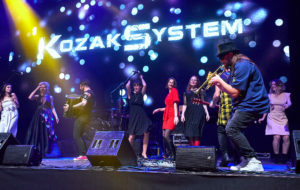 The performance of the group KOZAK SYSTEM provided the mood. 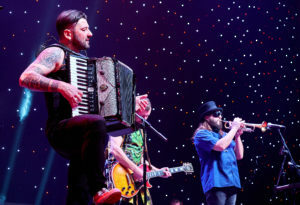 The evening’s emcees were Serhiy Prytula and Istan Rozumny. 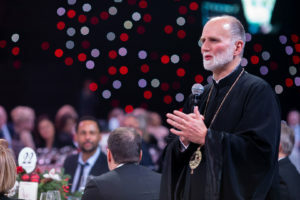 The Annual Fundraising Dinner in Kyiv, which started in 2008, is a traditional event in support of the Ukrainian Catholic University. 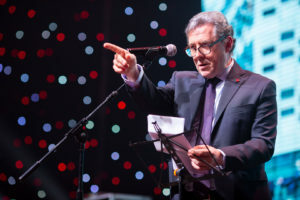 The Kyiv Friends of UCU organize the banquet. 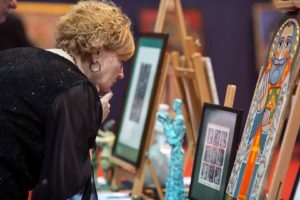 Every year the event’s Honorary Committee is formed; it consists of leading church figures, politicians, businesspeople, and artists. 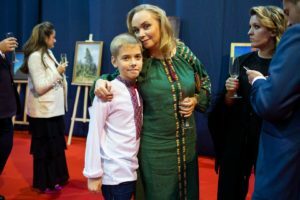 A traditional part of the Fundraising Dinner is a silent auction of artworks and a lottery, the lots of which are contributed by private benefactors and Ukrainian and foreign companies, and also embassies.